This is the first of a three-part series on calibration and optimization. The second part can be accessed here. The third part can be accessed here. Several years ago, I wrote a post that showed how to calibrate Stella and iThink® models using PEST, a third-party calibration tool (Using PEST to Calibrate Models). Starting with version 1.5, Stella Professional and Stella Architect have optimization built in. Since calibration is a special case of optimization, we can also use this feature to calibrate models (but stay tuned: calibration will be added as its own feature in the not too distant future). Let’s review the problem that was calibrated using PEST in that post and then configure the optimization to calibrate it within Stella. The model is a simple SIR model first presented in my blog post Limits to Growth and shown below (this version with all the optimization settings can be downloaded here). 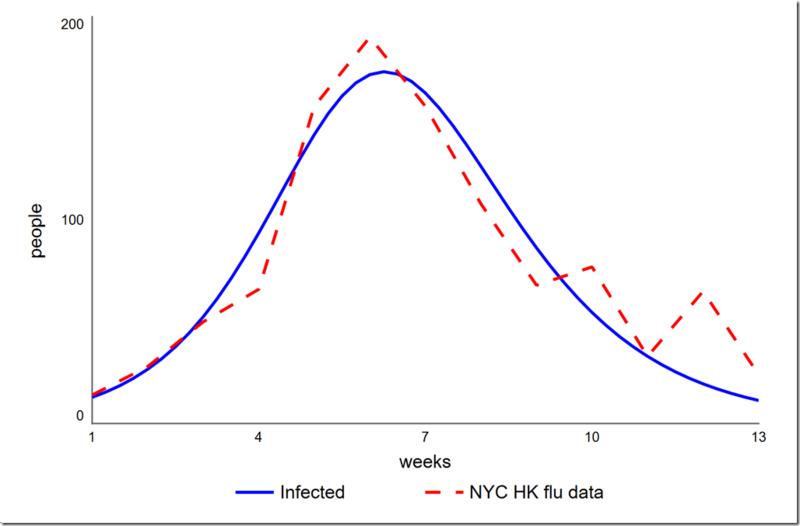 There are two parameters: infection rate and recovery rate. 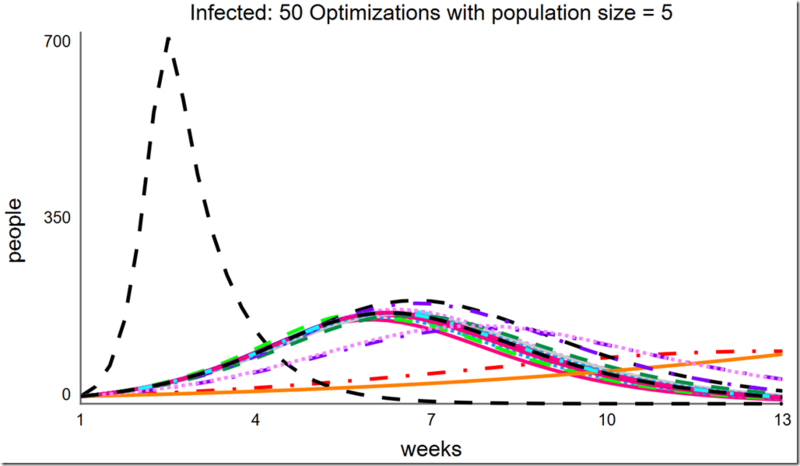 The Population size and the initial number of Infected people are also model parameters, but do not need to be calibrated (presumably, we know the population and the data tells us the initial number of infected people). 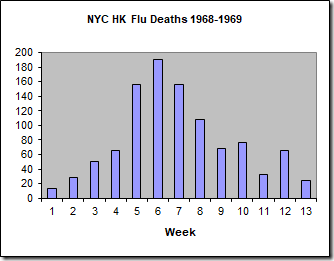 We will calibrate this model to the data set of the number of weekly deaths caused by the Hong Kong flu in New York City over the winter of 1968-1969 (below). Here, I am using the number of deaths as a proxy for the number of people infected, which we do not know. This is reasonable because the number of deaths is directly proportional to the number of infected individuals. 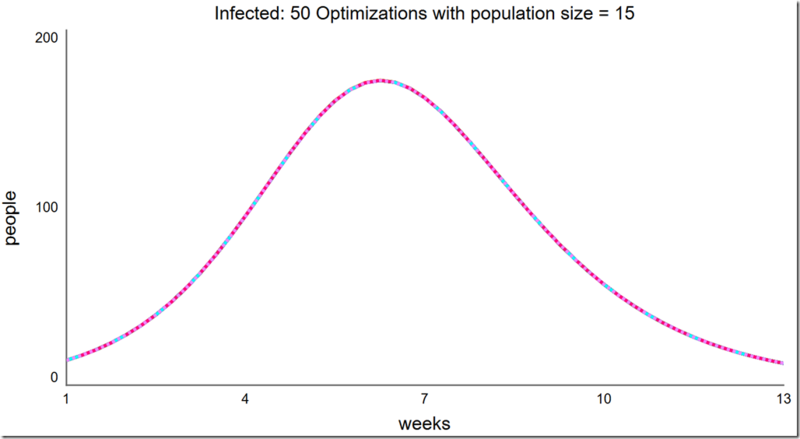 For this specific outbreak, less than 0.5% of infected people died, so we could multiply these numbers by 200 (1/0.005) to approximate the number of people infected. As I did not do this for the PEST calibration and wish to compare the results, I will not do this here either. Note that the method for determining when a data value is present is based on a regular pattern of data every week. If the data pattern is irregular, another method will be needed to identify the points, such as out of range values or two separate sets of data, one with the timestamps (x-points) of the data points and the other with the data itself (both in arrays). Stella includes a number of optimization methods, but I recommend you restrict yourself to Powell or Differential Evolution (DE). The former is a fast local optimizer (which will reliably find the global optimum under the right conditions) while the latter is a slower – but still fast – global optimizer. DE also allows multiobjective optimization, which we will explore in a later post. While Powell quickly and correctly finds the global optimum for this problem, I will use this simple problem to also introduce DE. Scrolling down, we need to set up the parameters that will be varied. If you remember, these will be infection rate and recovery rate. 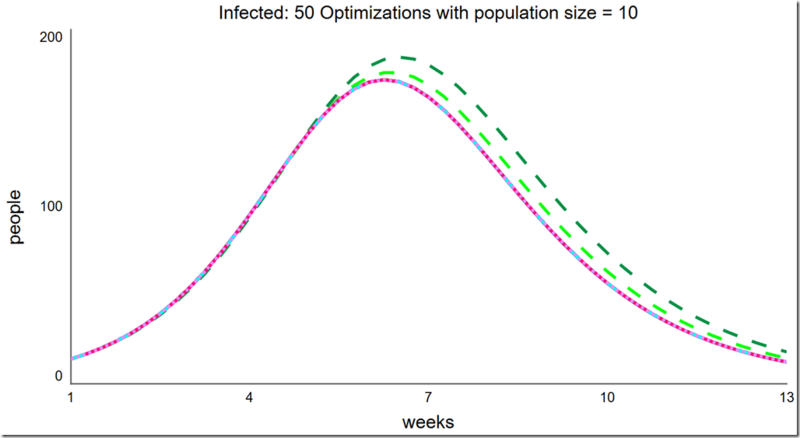 In the last section of the panel, under Optimization Parameters, click the green plus button to first add infection rate. While it is selected, set its Min Value to 0 and its Max Value to 10 (below the list). Repeat this procedure for recovery rate, setting its Min Value to 0.1 (a 10-week recovery period) and it’s Max Value to 1 (a one-week recovery period). 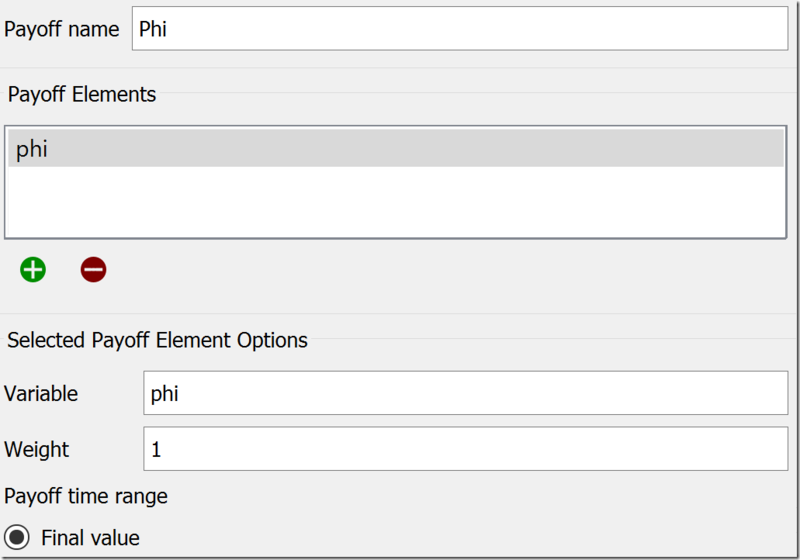 Make sure both of these parameters are now in the Optimization Parameters list. Click in any area of the diagram to deselect the panel. You should notice an O-Run button in the lower left corner of the diagram, just to the left of the play button. Click it to start the optimization. you should see the graph below, which matches the PEST result. The Simulation Log Panel should also have opened (if not, choose it from the Window menu). You will see that the final value of phi is 4785.7, identical to what we got with PEST. 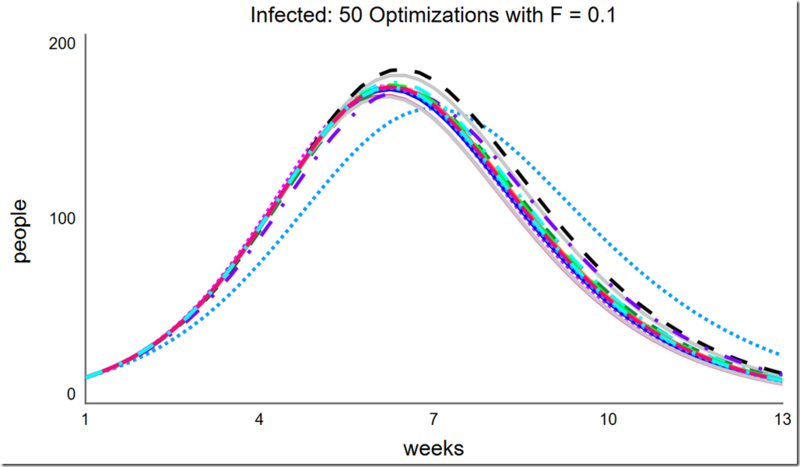 Earlier I said that we didn’t need to treat the initial value of Infected as a parameter since we knew its value. However, could we get a better overall calibration (which we have defined as a lower SSE) if we let it float? 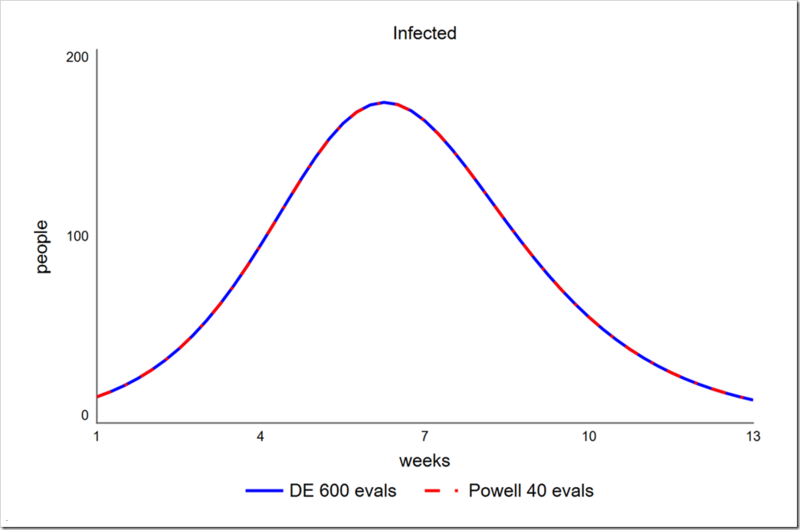 To test this, we have to add a variable initial infected to the model and set it to the value in the Infected stock (14). 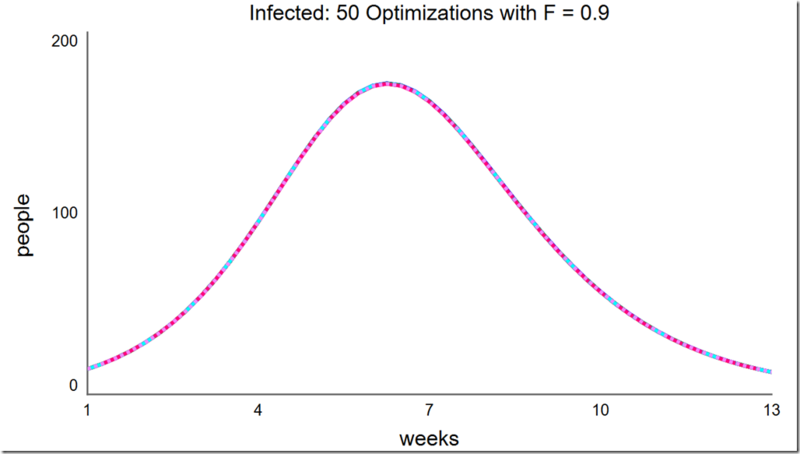 We then have to change the equation of Infected to initial infected (this is necessary because you cannot directly optimize a stock’s initial value). Once we’ve set this up, we can add initial infected to the Optimization Parameters on our Calibration setup on the Optimization panel. I used a range of 1 to 20, which yielded a slightly lower phi of 4765.6. The graph is shown below. 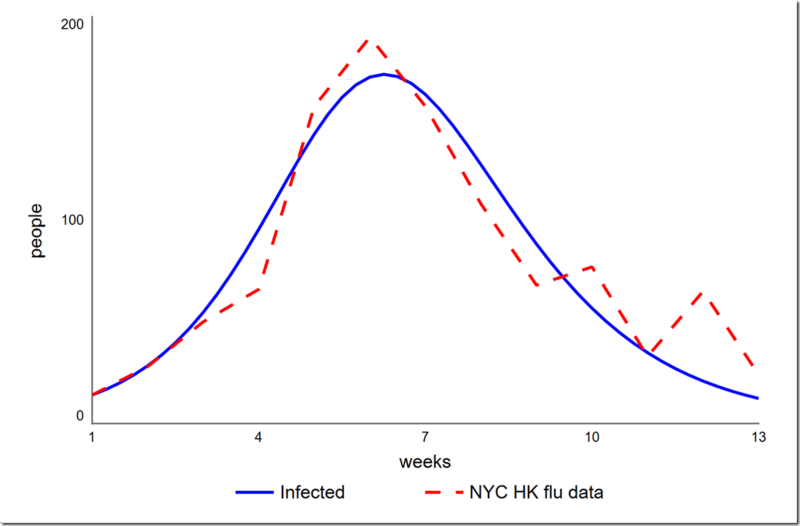 Note the initial value of Infected is now 12.9 instead of the 14 given in the data. I don’t think that small improvement (0.4%) in our chosen metric is worth moving the one data point we always hit. Using this simple model, let’s explore some aspects of DE. DE is largely controlled by the scaling factor, F, which typically ranges from 0 to 1. Smaller values of F lead to greater exploration of the fitness landscape while larger ones lead to exploitation of solutions already found (i.e, quicker convergence). There is a very real tradeoff between computation time required and probability of success (converging to the global optimum). For some fitness landscapes, setting F too high will lead to premature convergence at a local minimum. Another parameter that trades off these two factors is the population size. If the population is too small, there will not be enough diversity and DE will prematurely converge to a local minimum. If the population is too large, you will unnecessarily waste computation time. 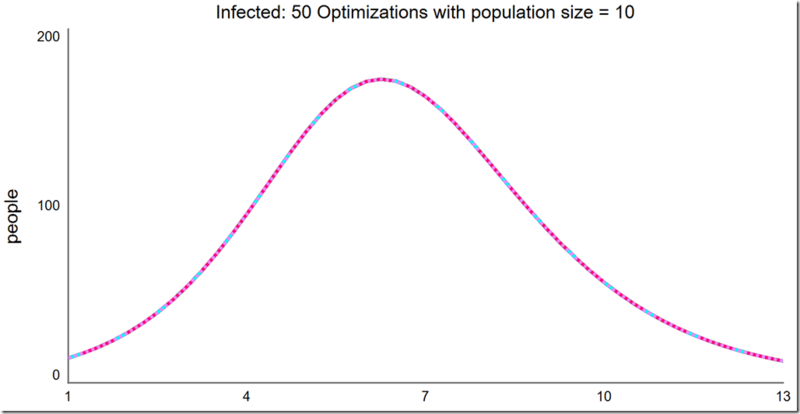 I have solved difficult two-objective optimizations with populations sizes as low as 60. Some single-objective problems can be solved with populations of 10 or fewer. Finally, the number of generations affects whether the optimization runs long enough to converge. This should be long enough to get a decent solution, but not so long as to waste time. An alternative approach is to set this parameter high and also define the relative tolerance, which detects convergence. Powell get a phi of 4785.7 in just 40 runs, compared to 4785.7 in 600 runs using DE (30 generations with a population size of 20). Note that the parameters chosen for DE in this test (smaller than those used above) do not uniformly lead to an SSE of 4785.7 – sometimes it’s 4785.8 or 4785.9. More runs would lead to more uniform results. Note also that a lower population size of 15 (450 runs instead of 600) yields only slightly more variation. In contrast, Powell always gets 4785.7. Why does Powell find the answer with far fewer runs? The answer has to do with the shape of the fitness landscape. Powell is a local hill climber and this function has a very sharp non-linear rise to a peak – an ideal problem for Powell. It is true that when DE is in exploitation mode it is also hill climbing, but it is looking at many different regions at once, trying to improve its chances of finding the global optimum. Stay tuned next time to learn how to solve a single-objective optimization problem.